Blurb: Ruling with an iron hand, the Church has eliminated the ancient pagan ways. Yet demonic gheists terrorize the land, hunted by the Inquisition, while age-old hatreds rage between the north and the south. Three heroes–Malcolm and Ian Blakeley and Gwendolyn Adair–must end the bloodshed before chaos is unleashed. So, I want to come out and say this first: I truly believe this book is better than what I’m about to write it to be. I loved the first book of this trilogy, The Pagan Night. The Iron Hound was good, too. I was looking forward to The Winter Vow immensely. Titan was kind enough, when I asked them if they had any spare copies lying around I could steal off their bookshelves and add onto mine, to allow me to do just that (thank you most sincerely). I think, however, two things happened that made me finish reading this book with only an “eh” feeling about it. One, is that even though I enjoyed the first two, it’d been a hot minute since I read them, so some of the characters, key players and events preceding this third installment were foggy in my memory; events and characters and deeds that, if I could have remembered them more acutely, might have made some of the elements and events in this book pack a higher punch. Second, I just finished reading my favorite book of the year, so far. I knew whatever book followed it was going to be read at a disservice, because following up Bloody Rose…well, that’s a really tall order to ask anyone and I’m not sure who, aside from the author himself, has the shoes to fill such a task. 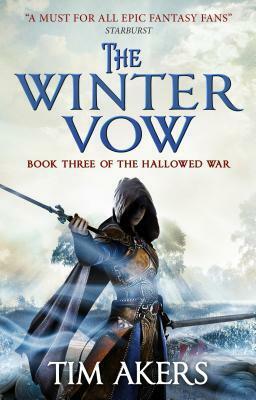 I just really wanted to read The Winter Vow, so it became the unlucky victim in that regard. I truly believe that, if I had brushed up a little better on the first two books, and chosen any other book to have this read before starting this one, I would have loved this immensely. That said, it wasn’t my favorite. There were a couple reasons for this. Mainly, I felt like the first half of the book dragged, with everyone arguing constantly about who was the heretic and who caused which grievance in the past and honestly, I just wanted them to grow up and move on, because there were a lot of other, more pressing and current issues for them to deal with right now, at the moment, than bickering over who did what in the past that is, in every sense of the word, irrelevant at the moment. But then, just when it started really picking up, towards the end–i.e., when all of our POVs come together for the final battle, the longest night, I felt it was too short, too rushed. Not the battle itself, perhaps, but the aftermath. I think I was more curious about what the survivors were going to do and how they were going to rebuild, after such drastic change and betrayal just corrupted their entire way of living and thinking, but it was all summed up in a manner of a few pages. But I wanted more. Oh, and my three favorite characters of prolly the entire series? All dead, by the end. That’s not necessarily a bad thing. I have plenty of series where my darlings are killed and I am furious, but it was perfect for the book and as a reader/writer, I can only applaud such a bold move. Here, I just grew irritated. But, I say again, I think, during another time and another read through, I’d recognize how right that was to do, even if I’m bitter about it. Don’t let this review fool you, though. I think Akers is a stellar writer. The depth of this world was intense and fascinating. He creates characters to root for, an elaborate and realistic religious system (most definitely including the strife caused by different beliefs) and his battle scenes are top notch. Unfortunately, I just read this book at the wrong time, which I’m pretty peeved at myself about, because I know it to be quality. If you’re a fan of this series, I don’t think you’ll be disappointed. And if you enjoy epic fantasy, I highly recommend you check this one out and enjoy it on my behalf, yes? In the meantime, I’m going to hope I move on from my reading hangover sooner rather than later. Great review! It’s always hard to review series books and you nailed it, even if you feel like you did this a disservice. This sounds like a good series for binge reading. I’ll definitely check it out. Thanks for the recommendation, Nicole! Oh, I hope you do check out the series! I remember falling in love with the first book so hard, so I definitely think this is a binge-worthy trilogy. Thanks for taking time to read my review!